Back in their traveling days, when their motor home took them on cross-country adventures, Mary and Robert Maier of Little Rock, Arkansas, made a stop in Lynchburg. "We got up on Liberty Mountain when they were first starting construction of dorms. Everything was red clay," Mary said. Mary, 85, and Robert, 87, haven't been here since and aren't sure they will get the chance to return. But one thing is certain - their support of Liberty University will continue. "I think Christian education for young people is the most vital thing today because there are so many things out there to turn them away from God," Mary said. On June 21, 2009, the Maiers celebrated their 25th wedding anniversary. They met through church friends in a camping group. At the time, they had both lost a spouse after 35 years. They quickly discovered they shared a love for camping and animals - Robert's dog and Mary's cat became traveling companions. Mary was the first to include Liberty in her estate plans, starting with Charitable Gift Annuities. "I started out small. Then I grew . . . along with the college." The annuities are "absolutely ideal," she added. "I just wish more people in our situation would investigate and invest in them." In 2004 her $100,000 donation established the Mary P. Slimer Maier Memorial Scholarship Fund; her trust includes "a sizable donation" to the fund. Robert, a retired rice and soybean farmer, followed her lead and purchased annuities. "I talked him into it," Mary said. "I said, 'Why should we wait until we die to give what we have away?' We could give it now and see what benefit is being derived from it and have a good income, too." 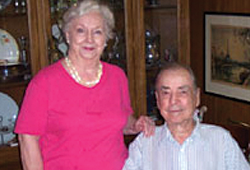 The couple, who have no children, enjoy regular visits from Liberty Planned Giving Officer Everett Foutz. "He keeps us in touch with what's going on and helps us realize that from time to time we can add to our charitable gifts," Mary said. "I have full faith and confidence that the money we've invested in Liberty is as good as we can do."